Hi guys! Hope you're all having a lovely weekend. I'm here again with a new Pinterest Style post. I really enjoy doing these, so hope you enjoy reading them! You can find me on Pinterest here if you fancy getting more fashion inspo. For today's look, I chose a super simple neutrals look that I absolutely love. You can never go wrong with some good old Converse. To start the look, I found a great grey ribbed vest on Topshop that's very similar to the one in the picture. For the white ripped jeans, I knew ASOS would have what I was looking for. They had plenty of white ripped jeans, but I thought these ASOS brand ones were the perfect match. For accessories, a simple black and gold watch really adds some glamour to the look, and this one from Olivia Burton is just gorgeous. Finally, for shoes, you can't go wrong with some classic white Converse. My own pair are looking pretty battered now, but I always pull them out when I don't know what shoe to wear. 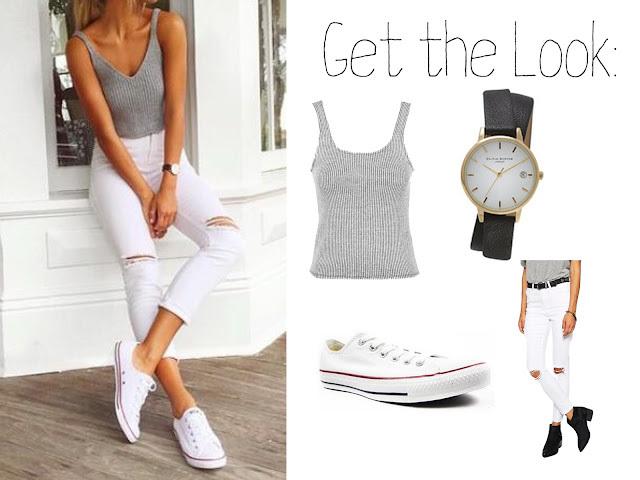 Find them on Jones Bootmakers here, where you can also find plenty of other colours and styles if white isn't your thing, or you fancy making a bigger statement with your Converse! What do you think of this outfit? Let me know in the comments!